How long will it take before my battery is discharged? This depends on its capacity and the amount of power consumed by the connected equipment. As a rule, the faster a battery is discharged, the less power it supplies. This also works the other way around: The longer it takes before a battery discharges, the more energy you can get from it. A 100 Ah lead-acid battery supplies a current of 5 amps for 20 hours, during which time the voltage does not drop below 10.5 volt. This amounts to 100 Ah. If a load of 100 amps is connected to the same battery, the battery will be able to power it for only 45 minutes. After this time the battery voltage will fall to 10.5 volt and the battery will be empty, having supplied no more than 75 Ah. In contradiction to the lead-acid batteries, the capacity of Lithium Ion batteries will not be effected by the load connected. A Li-ion battery will always supply 100 % capacity, independent of the connected load. The lifespan of a battery is related to how often and to what extent it is discharged. Proper charging with the right charger is also crucial. At a normal use for holidays and weekends, a lifespan of between five and seven years is quite common for Gel and AGM batteries. When batteries are frequently discharged you will need to adjust the capacity. There is also an option to use 2 volt cells. A lifespan of 15 years is not exceptional for this type of battery as long as they have the right capacity and are properly charged. Lithium Ion batteries are top of the bill. You can discharge and recharge them super-fast and they last up to three times as many cycles than other types of batteries. What is series connection and parallel connection? A series connection is used to increase voltage, while keeping capacity at the same level. Two serially connected 12 V/120 Ah batteries make a combined battery set of 24 V/120 Ah. In a series connection, the positive pole of one battery is connected to the negative pole of the other, with the poles that remain at the ends being connected to the system. Batteries with different capacities should never be linked in series. Parallel connection is used when you need to increase your capacity. The positive leads are connected together, as are the negative leads. The cabling from the battery to the system should be: Positive from battery 1 and negative from battery 2 (or the last in the parallel connection). If you need a 24 V battery set with a higher capacity, you can combine series and parallel connections. The cables from the battery to the system must be crossed: Positive from battery 1 and negative from battery 2 (or the last in the parallel connection). 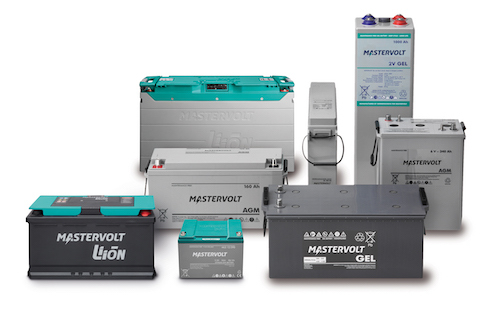 Mastervolt also supplies 2 V, 6 V and 24 V batteries; the principle of series and parallel connecting remains the same. Make sure there is sufficient space between the batteries when installing multiple batteries: There should be a ‘finger’ of space between them to allow the heat to be diverted. Incorrect charge voltage. Too low a voltage means that the battery cannot charge to 100 % - the sulphate then hardens on the plates and the battery loses its capacity. Excessive voltage causes the batteries to generate gas, leading to water loss and drying out. Excessive discharging. Discharging a battery further than its capacity shortens its lifespan. Too large ripple on the charge voltage. Cheap and old-fashioned chargers often have a significant voltage ripple (voltage variation) in the output voltage. The use of an alternator without 3-step regulator, a high ambient temperature or charging without temperature compensation. n The MLI battery should not be charged without measures such as a safety relay. Can I keep my batteries connected during winter? This is no problem for any Mastervolt battery, and can even be a benefit as the lower temperature extends battery life considerably. The batteries should be fully charged, however, and disconnected from any consumers. Make sure to consider hidden consumers such as voltmeters, clocks and the car radio memory. If the battery is connected to a Mastervolt battery charger with 3-stage+ charge characteristic, the battery is recharged every 12 days to ensure it stays in optimal condition. If you disconnect the battery we recommend disconnecting all consumers and connecting the power once every two to three weeks to ensure the batteries are recharged. If you don’t have access to power in winter, we recommend fully charging the batteries and disconnecting the battery terminals to ensure they are not discharged by small devices. We also recommend fully charging your batteries every two months and before they are reused. Wet batteries should be recharged regularly to prevent them from freezing. How should I maintain gel, AGM and Lithium Ion batteries? Gel, AGM and Lithium Ion batteries as opposed to traditional open batteries do not need maintenance, which means they can be installed anywhere. However, we recommend checking all the connections once a year to make sure that they are properly attached, and to clean the top surfaces with a slightly moist cloth. The batteries also need to be completely charged every time for a maximum lifespan.